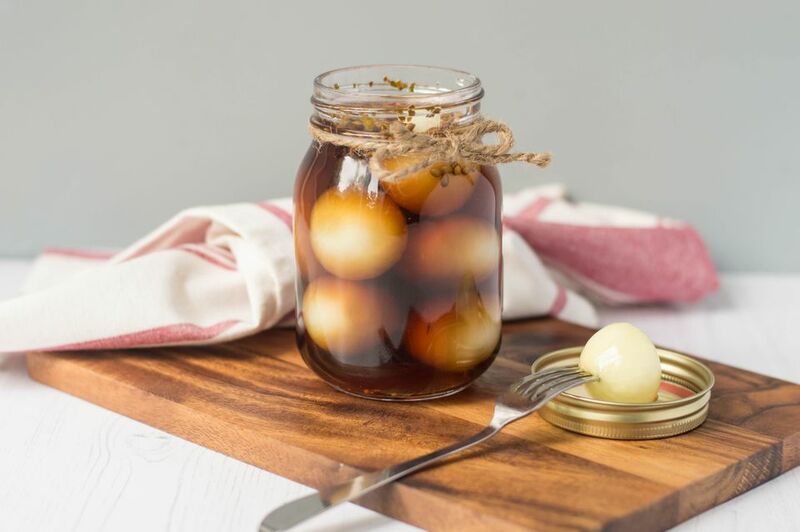 This old-fashioned pickled onion recipe is truly a national treasure in Great Britain. The onions appear alongside fish and chips, on a Ploughman's Lunch, with savory pies, and just about every dish where they can. You can buy any of the hundreds of commercial varieties groaning on the supermarket shelves, but nothing beats a jar of homemade pickled onions. We will not pretend that, though easy to make, the process of pickling onions is not quite tedious. So put the radio on or prop the iPad up and catch a little music while you are doing it. You will soon discover it is so worth the effort, and you can lighten the load and save yourself hours if you read the note about peeling onions at the start of the recipe. Tiny pickling or button onions are mainly available in the autumn and if prepared and stored early enough will be perfect for Boxing Day to eat with cold meats or pork pie. Some say Christmas is never the same without them. Also, they will keep almost year-round on a pantry shelf with no need to refrigerate. Sprinkle the salt over the dry, peeled onions. When ready, rinse the onions and dry with kitchen towel. Mix together the pickling spices. Place the spices, vinegar, and sugar into a large stainless steel pan. Heat to dissolve the sugar, but do not boil. Pack the onions into clean, sterilized jars. Pour the vinegar and spice liquid over to fill the jars, making sure each jar has pickling spices and that there are no air pockets. Seal the jars and leave to cool. The onions will be ready to eat after about one month, though they will be better if kept for two. Once opened, store in a refrigerator. A 1-pound jar will contain approximately 10 servings depending on the size of the onions. Peeling pickling onions is fiddly and time-consuming. To speed up the process, top and tail the onions. Then place the onions in a large heatproof bowl and pour boiling water over to cover. Leave to cool, and once the water is cool, presto, the skins will just rub away. Then, drain and pat the onions dry with a kitchen towel. Do not leave in the water once cool or the onions will start to go mushy when you preserve them. Once dried, proceed with the recipe.